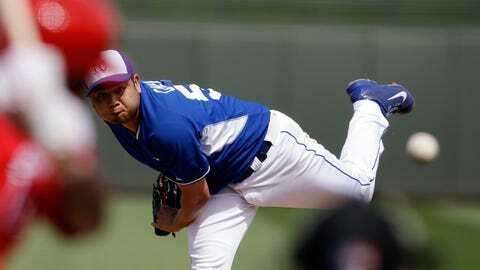 Bruce Chen had another solid outing for the Royals on Thursday against the Angels. Five things we learned from the Royals’ 3-2 loss to the Angels on Thursday. Remember when manager Ned Yost got ripped for his comments at FanFest regarding Bruce Chen? Yost said at the time that Chen deserved a spot in the rotation because it wasn’t fair to try and evaluate Chen simply on spring-training stats. "He’s just not a spring-training pitcher," Yost said. That has been the case in the past. Last spring, Chen gave up 19 hits, including seven homers, and 12 runs in just 16 2/3 innings. The spring before, Chen was even worse, giving up 37 hits, including six homers, and 23 runs in just 22 innings. "But when you get into the season with Bruce," Yost said, "you always know what you’re going to get — six or seven quality innings." But this spring, despite a couple of hiccups Thursday, Chen already looks in mid-season form. Coming into Thursday’s game against the Angels, Chen had given up three runs in eight innings. And on Thursday, Chen was again mostly sharp and in command, moving the ball in and off of both sides of the plate while inducing numerous harmless flyouts. Chen did give up a solo homer to Albert Pujols in the first, and a two-run shot to Mike Trout, but that was it through 5 1/3 innings. And the pitch to Trout wasn’t awful — a breaking ball below the knees that probably caught too much of the plate. And this just in — Pujols and Trout are pretty good hitters. Chen also made a fantastic defensive play, snatching a popped-up bunt by Erick Aybar in the air, then wheeling around and firing a strike to second base to pick off a wayward runner for a double play. There was quite an uproar on Twitter when some fans discovered that third baseman Mike Moustakas got a start Thursday at second base. Apparently, those folks were not paying attention when Yost said earlier this spring that Moustakas indeed would get some work at second base (as would Danny Valencia). The Royals don’t plan on breaking camp with a backup middle infielder, and Yost is looking for versatility from both Valencia and Moustakas. Moustakas didn’t get many chances Thursday but was flawless in three tries. He fielded a soft grounder cleanly for an easy out in the first. He also scooped up another grounder from Josh Hamilton in the fourth — Moose fielded that grounder from short right field as the Royals had the shift on, and made an accurate throw to Eric Hosmer. Moose fielded another routine grounder in the sixth for a routine out. Those Royals plans to start the season without a backup middle infielder almost got shelved when Valencia, who will start the season as the only backup infielder (we count Billy Butler as the DH), got nailed with a pitch from Angels right-hander Jared Weaver. Valencia was hit on the left wrist and was in obvious pain as he buckled over. Valencia left the game for a pinch-runner. Yost told reporters after the game that Valencia would be "fine" and was just bruised up. Mike Swanson, vice president of communications, texted that Valencia indeed went in for X-rays about 20 minutes after the game. Shortstop Jason Donald, who is not on the 40-man roster, continues to make a solid impression. Donald unleashed a bomb to left field off Weaver for his second homer of the spring. Donald, 29, came into the game hitting .313 with a .389 on-base percentage. And not that the Royals expect shortstop Alcides Escobar, bothered by a sore shoulder, to start the season on the disabled list but… It would be interesting to see if the Royals went with Donald or Pedro Ciriaco if Escobar did have to start the season on the DL. Left-hander Danny Duffy, trying to make the club as a reliever instead of a starter now, made his spring debut out of the bullpen. Duffy got through his one inning of work 1-2-3, though he did surrender two rockets to center field that Jarrod Dyson chased down.